Happy Friday! So it has been two weeks since I started working from home and I love every bit of it! I get to engage more with my design clients now and I know they are happy for that too. :) Overall - it's been amazing and I'm so excited where all this will lead. 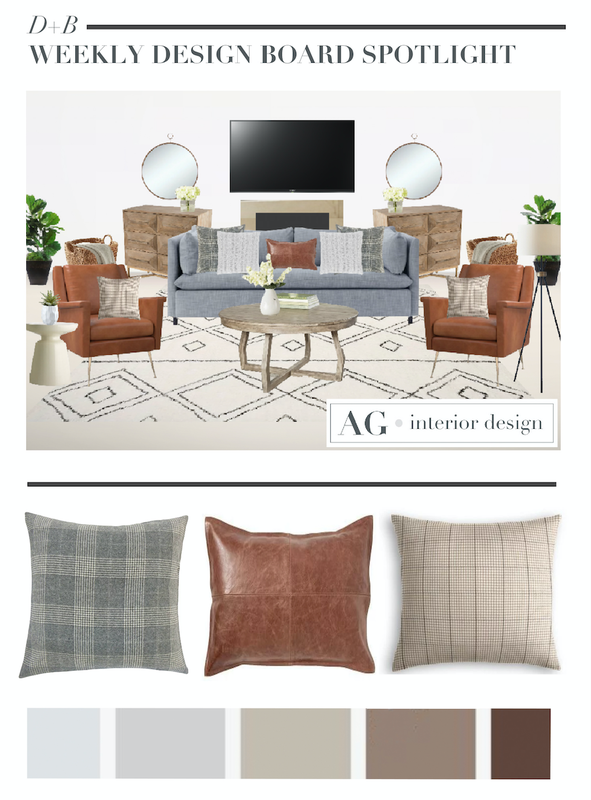 As design projects come to me, I love to highlight some of my favorite design boards that I create for clients. I will be doing design board spotlights every week on the blog now and I hope you will all enjoy reading and seeing every design! This isn't the only thing interior designers create. We also go behind the scenes dealing with construction documents, AutoCAD files, and back and forth emails to clients/contractors to make sure our final design approach is achieved - but I mean, c'mon, who wants to see all this craziness happen on the blog? LOL. Now for the fun part of interiors! For this particular client, we had to work around her existing West Elm sofa. I love her sofa already so it was super fun bringing in more texture in the pillows then pulling in these cognac leather WE lounge chairs. She does have a fireplace in the middle of her living room with nothing on each end. So we decided to pull in these beautiful chest for more storage. You can never go wrong with a round mirror above a chest of drawers. Who else is not over textured plaid just yet? I pulled these pillows to tie in all the warm tones throughout her space. I also pulled in a round coffee table that is a slight lighter wood tone then the chests. In my opinion, you never really want to be too "matchy, matchy". We also wanted this living room to feel much more comfortable since she has tile flooring. I know a lot of clients that don't like their existing tile flooring but you can always bring in a large beautiful rug that's contrasting to the tile as well. For this project, I selected this beautiful diamond, almost shag, rug. Flooring can be huge expense so I always advise clients that this is a perfect way to go if they are not shopping for new flooring. Overall, the client loved it and I can't wait to see the final results. Designed by: AG interior design + CAD for Laurel & Wolf. Work with me via L&W here!